As spring is finally here, I'll soon be having some get togethers on the back porch- which gets me thinking on pretty ways to style a table. 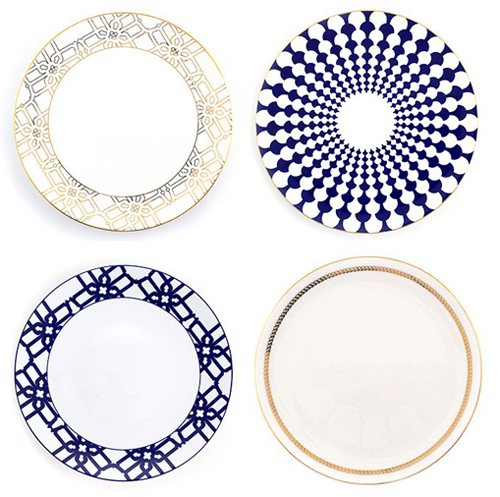 I always do a mish mash of vintage and new but these table settings by B by Brandie are a nice alternative too. Brandie Gehan of Dallas, Texas founded her home accessories line in 2012. It's modern, colorful and made to mix and match. 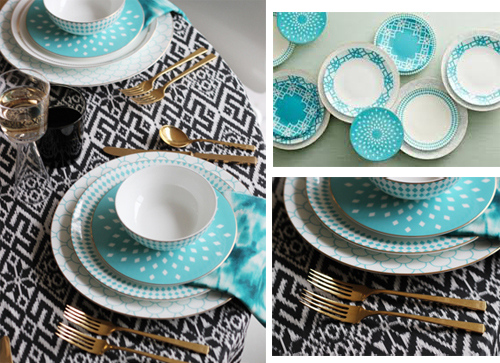 I particularly love her collection of turquoise plates, (includes appetizer, dessert, dinner and charger plates) many of which have a touch of gold. It adds that hint of fun sophistication. I like the idea of playing with all these pretty patterns, including the tablecloth. What a great style combination to inspire the rest of us. The gold flatware is a perfect complement too. Although I have fallen for everything turquoise in her shop, Brandie's collection has so much more to offer. See the entirety of her home goods shop, which includes dinnerware, flatware, vases, candles, glassware and more, here.